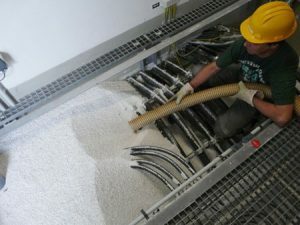 The extinguishant PyroBubbles® can be used exceptionally well in the field of preventive fire protection, particularly for filling cavities and hollows, cable trays and installation shafts (horizontal and vertical), where it can be used in bulk material form. A completely uncomplicated fire protection upgrade in the area F 90 can be implemented at any time, both for existing buildings as well as for new facilities. The amount of time required and the amount of material necessary to reach the required level of protection can be considered very economical. 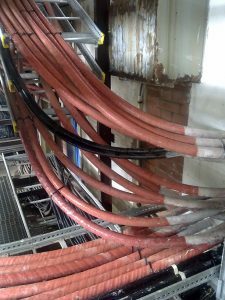 The ongoing maintenance costs for maintaining such coverages of cable facilities amounts to almost zero. 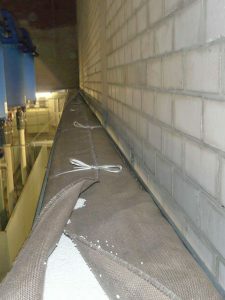 Subsequent covering of cables is also safely and quickly possible at a later date. 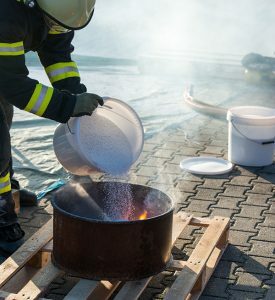 In fire protection for plant technology, especially in the areas of foundry and metallurgy, incorporating such fire protection into the ongoing production process is very appropriate in sensitive production areas, because selective protection using silo containers is possible so that particularly expensive production equipment can be protected. 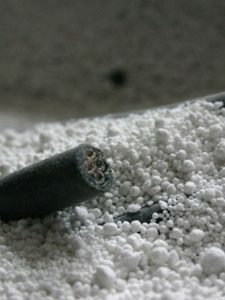 PyroBubbles® extinguishant can be used here in bulk form. The reusable extinguishing media causes no damage. Long production downtimes can thus be avoided. The supply of power is an essential part of production and for the entire functioning and meshing of all areas of an operating business. Securing the energy supply and protecting these systems in the event of a fire must have greatest priority for operators and responsible persons. PyroBubbles® are a means for providing such fire protection both for small and for large transformers. Within the framework of upgrading fire protection to achieve a significant improvement in protection for existing facilities, we were able to protect the transformer oil sump of a 380 kV transformer, filled with a total of 125 tonnes of oil. 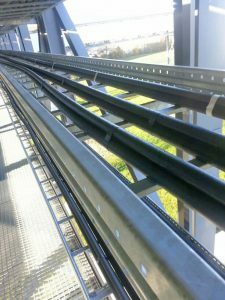 Superb extinguishing results were obtained using PyroBubbles® for plant protection and in the handling of triethylaluminium (TEA) in the area of specialty chemistry. The same applies for silane compounds and thermite fires, which are difficult to control with conventional extinguishing agents: PyroBubbles® safely enclose the fire and make it manageable. Here, too, a high level of fire protection can be achieved with silo containers. Alternatively, our → flexible extinguisher can be used as a preventive measure for medium-sized and smaller fire hazards.